Boss Katana 50 Guitar ComboThe BOSS Katana 50 Guitar Combo comes packed with an array of great features including 5 unique amp characters, a range of expandable effects and a handy switchable power control - allowing you to take it from 50w to 25 to 0.5w - making it a great amp for home, rehearsal or stage! Guitarists will love the exceptional tone and touch response of the Katana 50. 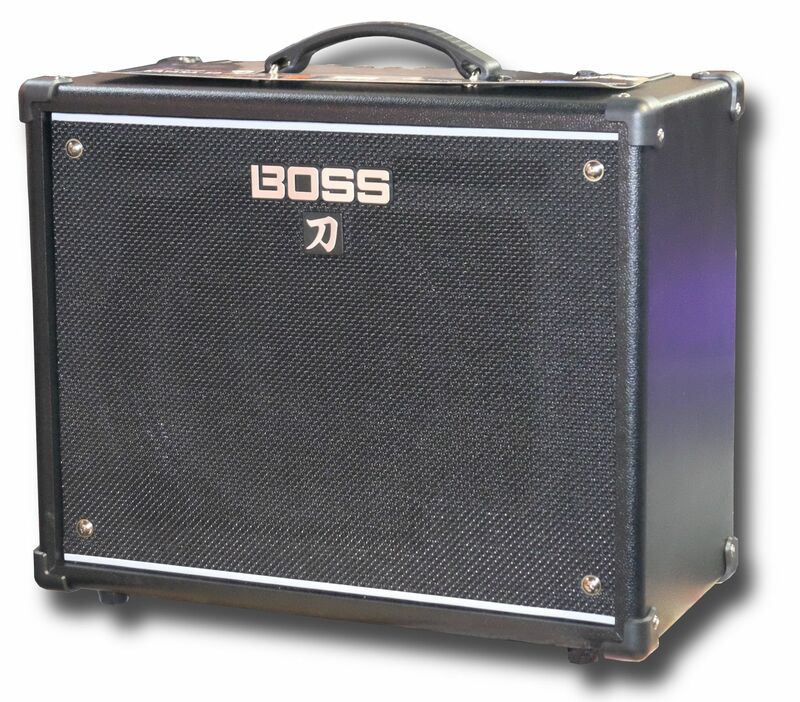 Loaded with a custom 12" speaker that is driven by a unique method, taken from the flagship Waza amp, that optimizes the speaker and cabinet character, you are treated to superb punch and presence, only normally found in high end amps. Able to deliver 50 watts of stage ready power the Katana 50 can also be switched to to more manageable levels - 25 watts and 0.5 watts - with the handy power control switch, great for a range of environments. As for tonal versatility, five unique amp character feature; Clean, Crunch, Lead, Brown (derived from the Waza amp), and Acoustic (for acoustic-electric guitars). Clean brings natural and transparent tones, Crunch gives added grit, Lead will take you from blues solos to searing rock leads, Brown is derived from the Waza amp, great for high-gain tone and finally Acoustic is optimized for electro acoustic guitars. For lovers of effects, there is plenty on hand to play with. Connecting the Katana 50 to the BOSS Tone Studio (via USB), and you access to 55 customizable effects, with everything from drives, delays, reverbs to more outlandish tone-shapers like ring mods, slicers and pitch shifting. Up to 15 different effects can be configured in the amp at one time, enabling you to bring fully prepared tones to the stage in one amp. As much as there is great depth to this amp, the simple control set will allow you to set some great tones. Dedicated knobs for amp type, gain and volume alongside the three-band EQ and effects section allow you to quickly dial in your tone. Memories can also be stored with a brief button hold. With its proprietary circuit designs, breakthough functions, tonal and power versatility...and all important affordability, the BOSS Katana 50 is a superb amp choice for any guitarist!